I've completed the running review of the Panasonic Lumix DMC-FZ18, complete with the conclusion. I've used two pages this time so you dial-up users won't have to sit through re-runs of "Miami Vice" waiting for the page to load. I put the "wrap-up" and "in a nut-shell" just below my initial findings, and above the first photo on page one. I've made adjustments in some areas I initially commented on, so if you've already read the review, be sure and check it out again. Also, on the second page at the bottom is the studio still life full resolution shot, compare it to the Olympus SP-550. I've added some additional shots to the Panasonic FZ18 review. The first page ended with the shot of the airplane, now there's a second page with telephoto samples and comparisons, and wide angle comparisons. I'll have a wrap-up complete by this weekend and that'll mark the end to the running review. Then I'll be busy trying to get both the Panasonic cameras put in the normal review format. Well, I've finally started on the Panasonic FZ18 review. 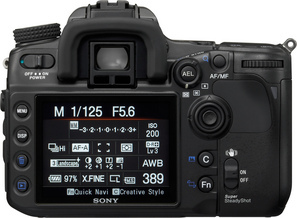 It'll be the now normal "running review" as I call it, just like the FX100 a month or so ago. I was hoping to get started this past weekend but I've been super busy, sorry folks. Follow the link and see what I've come up with so far. I'll update every couple of days so check back often. Right now I've got the macro picture up, a box contents pic (US) and some ISO comparisons to the Olympus SP-550UZ, with which I'll be comparing the FZ18 to throughout the entire review. Well, I've got my hands on a Panasonic Lumix DMC-FZ18. I'll be comparing it to the Olympus SP-550UZ by the weekend. I'm going to do my pre-review page as is normal now. Look for some ISO examples, sharpness and macro samples soon! I've finished the Sigma 10-20mm F/4-5.6 lens review. It has a lot in common with the Sigma 18-50mm F/2.8 reviewed farther down. Also, at the bottom of that review I show what just 1mm of focal length difference makes-as in Sony/KM 11-18mm. Next up, I'll try and get the Sony 24-105mm lens reviewed, and finish the Panasonic DMC-FX100 camera page in the regular format. My updates are a little slow in coming, thanks to my extremely despicable bad hosting service, so bear with me as I work things out. Sony announces their newest DSLR today, and I'm right on it tonight--better late than never. I was pretty sure they would bring this out soon, and I'm pretty sure they'll introduce a full frame in the near future, but that's not really going out on a limb if you've recently read what Sony has been up to. 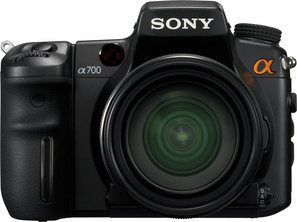 Look below for some details of the new Sony A700, meant to compete with the likes of the Canon 40D, D300 Nikon and a couple other mid-level cameras. Also new are the (all Sony) DT 16-105mm F/3.5-5.6 zoom and the DT 18-250mm F/3.5-6.3 super zoom. Planned for a little later is the new 70-300mm F/4.5-5.6 SSM G lens. 3" LCD with 921,000 pixels. Magnesium alloy frame with weather sealing. ISO 100-160?-6400, let's cross our fingers!! Hopefully it'll be better than the A100. AF illuminator, and it's about time. Two card slots, CF and Memory stick. 5fps RAW, up to 18, unlimited JPEG Std/Fine. New battery, A100 battery won't work in A700, but new battery will work in A100, go figure! Lots of new dedicated buttons. HDMI video output for TV. Body available on or about 9/28/07 according to the SonyStyle website, which has a long history of missed release dates. Priced at $1399 body only. Kits include 18-70mm cheap lens for $1499, and a new DT Sony 16-105mm for $1899 in Nov. I added some better bad focusing examples to the Sigma 18-50mm review below. Also, I actually came up with a percentage for out-of-focus shots, for 18mm and the telephoto 50mm end. Go down near the bottom of the review page to check it out. You've probably noticed I finally moved May through July home page entries to the Home Page Archives on the Nav bar. I'll try to keep it a little more caught up from now on. On a last note, I'm beginning the Sigma 10-20mm lens review now (I guess I'm a glutton for punishment) but I've used it extensively and it's much better than the 18-50mm. Look for a review in a couple of weeks or sooner, and a comparison page to the Sony 11-18mm lens. Sigma sycophants do not read below. I've finally finished my review of the Sigma DC EX 18-50mm F/2.8 macro I started a month ago. It was super soft, so I sent it back (my nickel) to a Sigma repair facility and they claim they repaired the rear lens group. It works much better, vastly improved I'd say. In fact it's very sharp, even at F/2.8, but the inevitable caveats always seem to appear. This time it's focusing accuracy. I think with all the new demand for DSLR cameras, and a natural demand for additional lenses, that maybe Sigma, to name one, is running a bit behind schedule, so they simply cobble together a lens and hope it works ok. I've never had any trouble in the years past, but this year I'm one for three. I've also cancelled my Sigma 100-300 F/4 lens that I ordered from Adorama, it wasn't their fault, it was Sigma's for not producing the lens in the time period promised---I waited almost two months. I'm going to go ahead with the review based on a couple of other reviews I've read. I think my copy is about average at this point, and maybe slightly above average in sharpness. Sigma lens buyers-and all others I suppose-should be aware of performance issues when buying a lens, make sure you check it out before you do any serious photography.